I was one of those nerds that fell into cooking very rapidly and started buying cookbooks to try to absorb everything I could about cooking. I quickly found that I gravitated towards american cuisine and classic french. I don’t have the background or patience to cook fine french cuisine (though I did spend hours learning to tourné vegetables, which is of no use to me now) but I quickly gravitated towards Anthony Bourdain’s Les Halles cookbook because it was accessible classic french food. 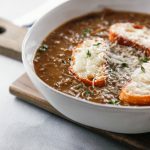 One of my favorites was a French Onion Soup recipe and I’m happy to have done my own rendition here. 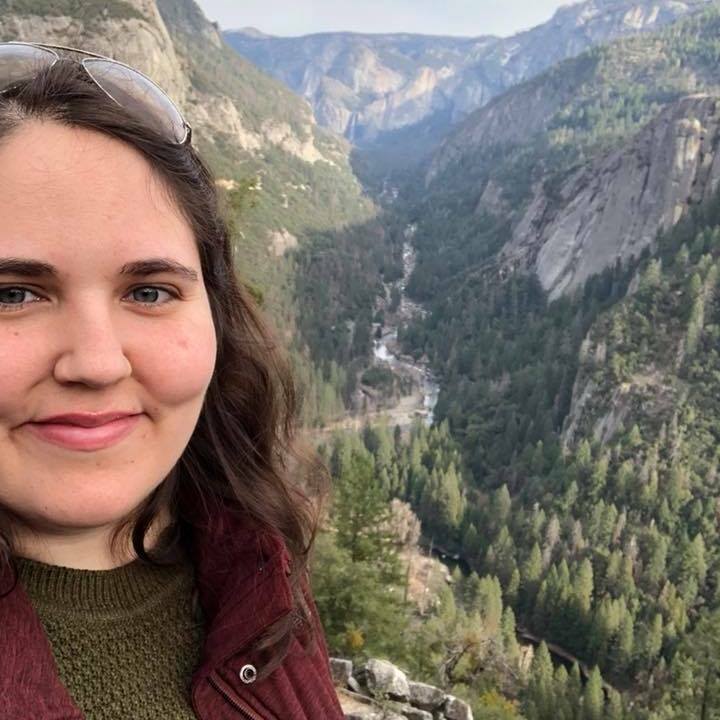 Anthony Bourdain’s death shook me, which was shocking to me because I’ve never felt this before with a celebrity death. But i was a Bourdain fan, he is one of my heroes in the culinary world. I ate at Les halles in New York where I tried escargot and pidgeon for the first time, I saw him give a talk with Jaques Pépin, I’ve read all of his books and watched his shows and I received a signed copy of his most recent cookbook Appetites for my birthday last year. I was really happy to reminisce about my Bourdain experiences while making this recipe because this is the type of food that reminds me of him. 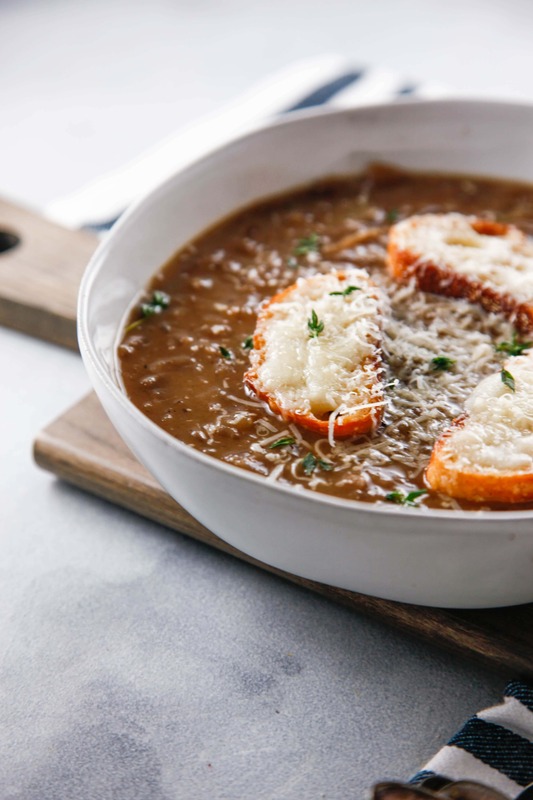 Is French Onion Soup easy to make? The answer to this is definitely yes. This is a fancier soup that is deceptively easy to make. Someone at a beginner level in cooking could make this with no hacks and end up with a delicious meal to impress their friends. The part that takes the longest is carmelizing the onions, which isn’t hard it just takes a while. And if you don’t want to use wine, you can omit it from the recipe and add more broth to get the soup to the correct consistency. 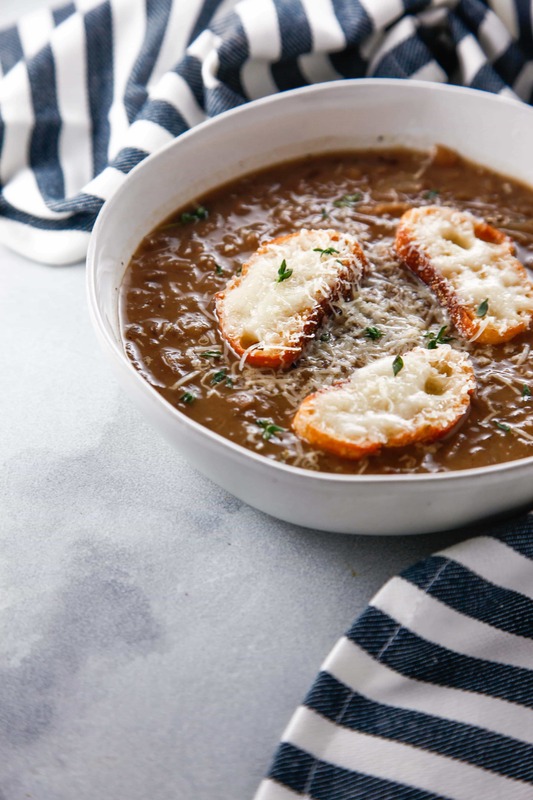 The easy French Onion Soup is and updated version of a classic bistro French Onion Soup. Experience classi France from your own kitchen. Slice onions thinly. Put onions into a large dutch oven or pot, add butter and bring to a medium-high heat on the stovetop. Add a pinch of salt and pepper, garlic, thyme and bay leaves. Cook for 25 minutes or until onions have caramelized and turned brown. Stir frequently. Add red wine. Bring to a boil, then reduce to a simmer for 10 minutes or until liquid has reduced by half. Stir in flour and cook for 1-2 minutes so that flour is not raw. Add beef stock and stir until broth is thickened. Cover and let soup simmer until baguette is ready. Heat oven to 400 (200 degrees Celsius). Slice bread and brush with olive oil. Place onto a baking sheet and bake for 5 minutes. Remove baguette and cover each slice with gruyere. Return to oven and bake until cheese is melted. Spoon soup into a bowl and add in baguette slices. Then enjoy! It amazes me how she can sleep anywhere, and usually upside down. 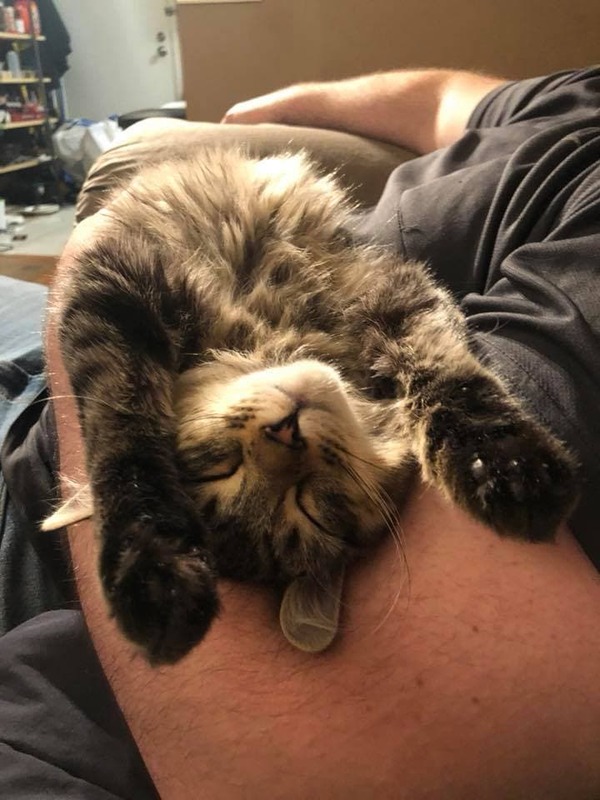 Cats are strange, but I love all the personality! I am sure this will hit the spot once it cools off we are still challenged by over 94 degree heat here. The family will love this saving for late December good for a holiday starter too! 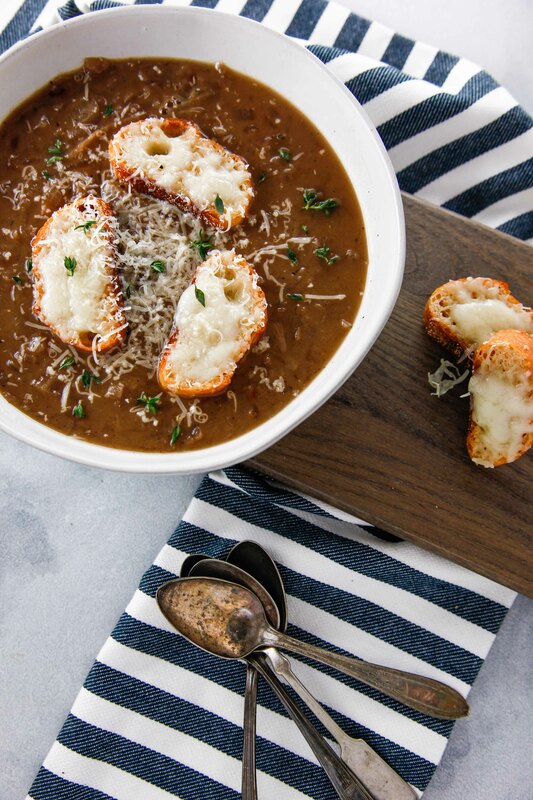 We love French Onion Soup and I’ve yet to make it at home. The rich onion flavor is so good and then the cheese on top. Just thinking about it making my mouth water. I’ve got just the occasion where I want to make this soup. I have not eaten French onion soup in ages. I use to love making it often in the past but my kids never warmed up to it. This sounds so delicious. I love the color you have here. Looks yum. You’re totally right about this being an easy soup, it just takes a little bit of patience to properly caramelize the onions. 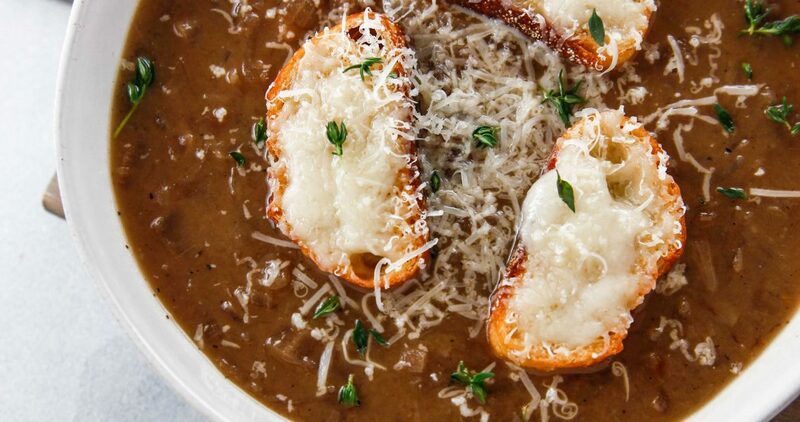 I love a good French onion soup with plenty of gruyere like this! I love the sound of this soup and it looks fantastic with the sliced bread and cheese! I’ve never made French Onion Soup and haven’t had it in ages either. Definitely craving a bowl of this today! I love good french onion soup. When the weather gets cold I need a bowl of soup. This is so easy and looks delicious. Cheese and bread make it more yum.